By Charumini de Silva Educat ion reforms in Sri Lanka have to start from the ground up as shown by 150,000 school dropouts, a top education expert said, calling on local universities and the University Grants Commission (UGC) to take greater responsibility to develop skills among local youth. “As the chief regulatory body of the State universities, the UGC must take major responsibility and share of the skills mismatch Sri Lanka is facing today,” UGC Chairman Prof. Mohan de Silva delivering the keynote address at the Employers’ S y m p o s i u m t h e m e d ‘Repositioning Sri Lanka: Meeting the Employment Challenges of the Fourth Industrial Revolution’ organised by the Employers’ Federation of Ceylon (EFC) recently. He pointed out that the UGC was well aware that designing higher education strategies based on the evolving needs in line with global trends was important for Sri Lanka to face the technological driven regional and global competition in the 21st century, adding that the Government would outline it in the 2017 Budget. Noting that inability to produce human capital to the expectation of the employers and the widening skills mismatch had been highlighted in many countries, he said Sri Lanka certainly was not an exception. “Production of high quality human capital for Sri Lanka is a prime responsibility of the higher education, technological, and vocation training sector of the country,” he stressed. 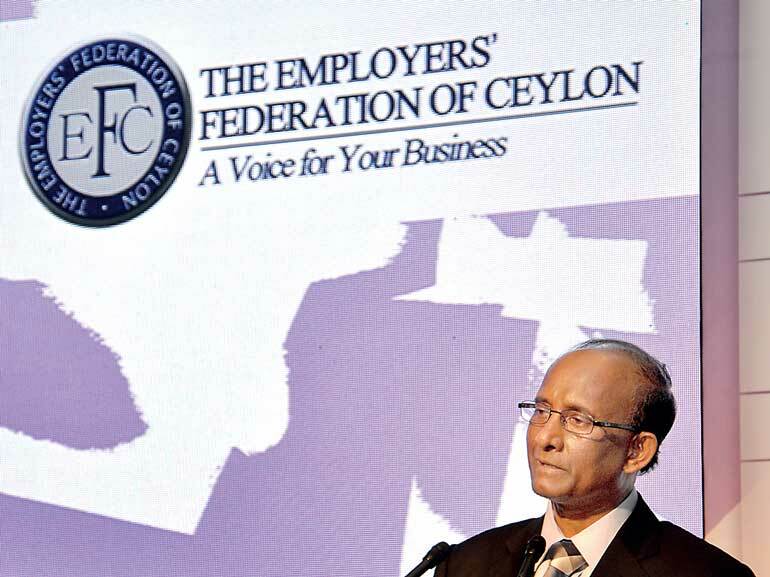 Acknowledging employability of the graduates is a question often asked by society, policymakers, industry and parents, Prof. de Silva insisted it was time Sri Lanka created a platform in partnership with industry and university which would help to produce able human resources to global industries, economic development and job creation. He emphasised that to understand the nature and the magnitude of the problem in the sphere of education and higher education of the country and to create strategies, one needs to understand the problem from the stage of primary education. Data from the Ministry of Education shows primary education admission is around 350,000. However, there is a significant drop out by the time they reach Grade 13. According to data from Grade 1 to 13 around 150,000 students drop out without a clear path and highest school dropouts occur between Grade 8 and Ordinary Level (O/Ls). Looking at the situation objectively Prof. de Silva said the latest study done by the Ministry of Higher Education in 2014 shows that 51.4% Arts graduates, 23.3% Science graduates and 19.1% Management graduates are not employed for six months to one year after leaving the university depending on their degree programs. Although Sri Lanka stands tall when it comes to gender equity for access to higher education in the region with 62% of university entrants in 2015 being females, he said it was a pity that female unemployment in the Arts stream after graduation was a high 85.9%. “There is also a national outcry why Sri Lankan universities cannot produce a safe and conducive environment for students to study. During the last year we have taken several important steps to curb various ragging, sexual and gender based violence that goes on in our university systems,” he added. He said educational policy reforms for the school education sector was under consideration and discussion. In accordance with the Government’s policy agenda, the Ministry of Education is taking steps to develop several important policy reforms looking at the education system from the equity, quality and efficient perspectives and considering future demands. “New reforms are being drafted to address the dropouts by creating opportunities for vocational training at a very early stage. The existing system of the Advanced Level subject stream is being revisited, which is timely,” Prof.de Silva stated. Senior officers of the Ministries of Education and Higher Education, UGC, National Institute of Education, Ministry of Science and Technology Technical and Vocational Training Authority and industry leaders are finally sitting at one table to iron out these issues. The Chairman also said the Cabinet had instructed to create a mechanism to have all State universities established under different Acts under supervision and regulation of UGC. The Symposium highlighted issues for discussion with the end objective of finding sustainable solutions that would enable employers to incorporate best practices and employment strategies suited for their organisations, which in turn will enable the private sector to regain its position as the growth engine of the national economy.